We are your western wear destination! Tucked in the back part of the store is a hidden gem – the Western Wear Boutique at Hanson Grain! We have over 800 pairs of boot IN STOCK - our selection is the BEST in all of New England! Top brands such as Corral, Justin, Ariat, Dan Post, Laredo, and Tony Lama for both Women and Men. Our friendly staff is here to help you find the right boot. Fit is everything - if they aren’t comfortable you won’t wear them! 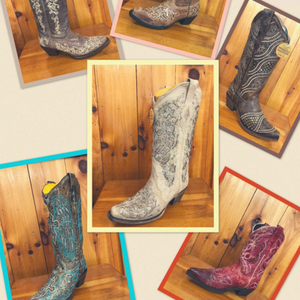 Whether you are looking for boots for a country concert, line dancing or the farm, our selection will make you smile. Country Style Wedding? Boots for the bride can range from a classic brown simple style to our full-out glitter boots from Corral – SO many lovely options! We offer discounts for wedding parties so that everyone in your wedding can look their best.